TUESDAY, JAN. 3, 2012 - The Repertory Theatre of St. Louis' production of "Sunday in the Park with George" at the Loretto-Hilton Center in St. Louis. �Photo by Jerry Naunheim Jr. The year 2012 was tumultuous in many respects, so perhaps fittingly Wicked is the title of the production that brings down the curtain on the last 12 months. A record drought plagued the St. Louis area, temperatures sweltered in an elongated summer and the area’s economy staggered toward a slow but steady recovery. All of this took place in the face of impending doom predicted centuries ago by the Mayan calendar. While the local theater scene felt just a bit less busy than the last few years, nonetheless a couple of hundred productions were available to patrons in search of something new, something different or something quite familiar and beloved to entertain or challenge them. Touring professional, local professional, community, college and cabaret performers offered a rich and textured tapestry of works for consideration. What’s your pleasure when you head to the theater? Are you a fan of farce and zany satire? If so, you likely reveled in New Jewish Theatre’s presentation of Jacob and Jack, in which six savvy performers (Bobby Miller, Kari Ely, Julie Layton, Terry Meddows, Donna Weinsting, Justin Ivan Brown) took director Edward Coffield’s cue and blithely time traveled between contemporary Chicago and yesteryear’s Yiddish theater. At The Rep, Paul Mason Barnes directed a zippy, non-stop funfest version of The Comedy of Errors set “near” New Orleans, circa 1936. If you thirsted for all things Bard, you had to love St. Louis Shakespeare’s inspired insanity, The Compleat Wrks of Wm Shakspr (Abridged), with Ben Ritchie, Jamie Kurth and Joshua Nash Payne running amok under the deranged direction of Suki Peters. Peters returned later in the year with the always irreverent Magic Smoking Monkey Theatre to present an impossibly chaotic but frenzied splendor called Stupefy! The 90-Minute Harry Potter, taking Jaysen Cryer’s whimsical adaptation and ‘guiding’ her group of manic misfits in uproarious fervor. On a smaller scale, an inspiring Greg Fenner managed to impersonate 41 different characters within the one-man, 90-minute wonder known as Fully Committed, director Gary Bell’s holiday present to enthusiastic Stray Dog Theatre audiences. Steve Isom and Christopher Lawyer made for an unlikely but oddly charming duo as disparate dads coaching their sons’ Little League team in HotCity’s amusing Rounding Third, while The Rep unwrapped a fabulous holiday present for its patrons in Larry Shue’s fitfully funny farce, The Foreigner, thanks to director Edward Stern and an harmonious cast who worked with a group of technical artists who teamed on the same show at The Rep two decades plus earlier. And the Blue Man Group made its local debut at The Fox in November, drumming and splashing and painting and gumball-catching their way into the hearts of incredulous viewers. Lovers of musicals were catered to in glorious fashion by a number of local companies. Artistic director Scott Miller and his New Line Theatre reprised one of their ‘greatest hits,’ High Fidelity, which took top honors in the Ladue News end-of-year review in 2008. Jeffrey Wright reprised his star turn as Rob Gordon, a walking encyclopedia of rock music but a romantic disaster, in a show filled with great tunes and wonderful comic moments. Miller also delighted audiences with the American regional premiere of Cry-Baby in a version revised by lyricist David Javerbaum, based on a movie by John Waters. Ryan Foizey sizzled in the title role of counter-culture ‘drape’ Wade ‘Cry-Baby’ Walker, circa 1954, with Taylor Pietz as ‘good girl’ Allison and Terri Carolan as Cry-Baby’s wacky wannabe girlfriend. The Fox brought two outstanding touring shows to town. An updated version of the venerable classic, West Side Story, was magnificent from start to finish, much the same experience one felt watching the return of The Lion King to The Fox’s sizable stage as well as its aisles for the jaw-dropping opening number. New Muny executive producer Mike Isaacson wasted no time placing his stamp on shows performed in the mammoth Forest Park amphitheater. Right out of the gate he introduced Muny audiences to Thoroughly Modern Millie, a 2002 Broadway blockbuster that garnered six Tony Awards for its producers, including Isaacson and Fox Theatricals at the time. The summer also brought the first locally produced Muny version of Bob Fosse’s signature work, Chicago, that came alive with dancers who captured Fosse’s distinct choreography and singers who felt right at home with the music and lyrics of John Kander and Fred Ebb, including local performer Dean Christopher. Later still, director Lara Teeter brought a whimsical, localized treatment to Andrew Lloyd Webber and Tim Rice’s still infectious Joseph and the Amazing Technicolor Dreamcoat. Stages St. Louis enchanted audiences with a smooth and steady presentation of My One and Only, another in the compilations of tunes by brothers George and Ira Gershwin that utilizes a silly plot to re-introduce modern audiences to the Gershwins’ lasting melodies. For something completely different, Stray Dog Theatre welcomed us to the raffish and ribald Great American Trailer Park Musical, first presented at the New York Music Theater Festival in 2004. Justin Been directed in deliciously decadent fashion, with the notable assistance of performers Kim Furlow, Kay Love, Jessica Tilghman, Keith Parker Jr., Lindsey Jones, Zachary Stefaniak and Jamie Lynn Marble. Stray Dog also mounted a memorable production of Urinetown with a spirited cast including Antonio Rodriguez, Deborah Sharn, Keith Thompson, Berklea Going, Christopher Brenner and Jennifer Theby in the best interpretation of heroine Hope Cladwell this side of Broadway. Dramatically speaking, there were numerous memorable moments in 2012. The Rep presented a gripping story of modern terrorism in playwright Ayad Akhtar’s The Invisible Hand. Upstream Theater’s artistic director Philip Boehm translated Polish journalist Kazimierz Moczarski’s hair-raising memoirs about survival in a post-World War II Stalinist prison in Conversations with an Executioner, with spellbinding performances by Gary Wayne Barker, John Bratkowski, Robert Mitchell and J. Samuel Davis as Moczarski. A trip to Rolla was made all the more pleasurable by an affecting and endearing performance of The Diviners, a Depression era tale that director F. Reed Brown beautifully realized in the Ozark Actors Theatre’s inaugural season and once again for this 25th anniversary presentation that was anchored with solid performances by Aaron Orion Baker and Gregory Cuellar. Directed Gary Wayne Barker utilized the talents of four excellent artists in a poignant and melancholy production of Donald Margulies’ Pulitzer Prize-winning Dinner with Friends, a marital cautionary tale presented by Dramatic License Productions in Chesterfield. Michelle Hand, Christopher Hickey, Sarah Cannon and Chad Morris showed us precisely how some marriages survive while others dry up and blow away. Kirsten Wylder and Justin Ivan Brown were harrowing in Muddy Waters Theatre’s Bug as a fragile and despondent waitress and the paranoid stranger who convinces her that he is the victim of dastardly experiments by the U.S. Government in Tracy Letts’ horrific drama. John Pierson and Rachel Fenton traded increasingly heated barbs as a haughty college professor and the initially timid student who accuses him of sexual harassment in HotCity’s tinderbox retelling of David Mamet’s searing drama, Oleanna, expertly directed by Annamaria Pileggi. Mustard Seed Theatre’s artistic director Deanna Jent presented a strong and stunning look at the loneliness and desolation of women on the American Western frontier in Going to See the Elephant, with expert work by Nancy Lewis, Emily Baker, Suki Peters and Jessica Haley. New Jewish Theatre offered an affecting rendition of Lanford Wilson’s Talley’s Folly, with Meghan Maguire and Shaun Sheley exchanging vulnerabilities in the 1940s Ozarks, while Slightly Askew Theatre Ensemble gave a superb telling of another Wilson drama, Burn This, with fabulous portrayals by Ellie Schwetye, Adam Flores, Jared Sanz-Agero and Reginald Pierre. R-S Theatrics continued its welcome knack of finding offbeat and probing pieces with productions of Adding Machine: A Musical, Suicide, Incorporated and Autobahn, while West End Players Guild brought us memorable takes on Irish playwright Conor McPherson’s chilling tale, The Seafarer, and British playwright Chloe Moss’ two-woman story, This Wide Night, featuring strong characterizations by Jane Abling and Rachel Hanks. • #10 (tie): Way to Heaven (New Jewish Theatre). A Red Cross representative visits a Nazi concentration camp in 1942 and discovers that its Jewish prisoners have their own ‘village,’ including a mayor, brightly painted houses and even a synagogue. It’s all a cruel ruse concocted by the camp commandant, something Spanish playwright Juan Mayorga skillfully depicts in five scenes over two taut acts that show the courage of the prisoners in their hellish situation. In the New Jewish Theatre presentation, director Doug Finlayson subtly revealed the multiple layers of the script in cunning and fastidious fashion. Robin Weatherall’s poignant sound design utilized music written by composers who died in various extermination camps in the Holocaust. The superior cast was led by Jason Cannon as the chilling commandant, Terry Meddows as the Jewish camp elder and Jerry Vogel as the remorseful Red Cross representative. 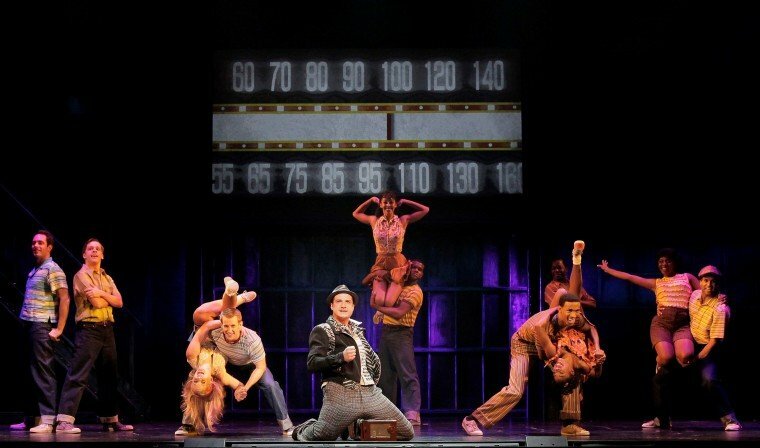 • #10 (tie): Memphis (Touring Production at The Fox). It’s 1951 and Memphis is a segregated city and society, like most of the South in that era. An aimless young white man named Huey Calhoun wanders into a black blues club on Beale Street and is swept away by his fervor for the music. Calhoun finagles an opportunity as a DJ to play the ‘black’ music for a white audience “in the middle of the (AM) dial,” and rock ‘n’ roll is on its way as the definitive musical form of the mid-to-late 20th century. Memphis is a joyous musical and a living, breathing history lesson, smartly capturing the simmering prejudices of America in the 1950s that resulted in the Civil Rights Movement. It benefits from a catchy and infectious score by Bon Jovi keyboardist David Bryan and an intelligent, intriguing script by Joe DiPietro. • #9: Angels in America (Stray Dog Theatre). Artistic director Gary Bell started preparing his cast a year in advance for their daunting challenge of memorizing playwright Tony Kushner’s Pulitzer and Tony Award-winning scripts that cover seven and a half hours over two complete plays, Millenium Approaches and Perestroika. The Herculean effort was stunning in both parts, which were performed in repertory over successive weeks at the Tower Grove Abbey theater. Stray Dog’s undertaking of both aspects of Kushner’s milestone achievement was theater of the rarest order. Sub-titled A Gay Fantasia on National Themes, Kushner’s epic focuses on three primary storylines: Prior Walter XXXIV’s contraction of AIDS and its impact on his relationship with his Jewish lover, Louis; a Mormon Republican named Joe Pitt, who fights his homosexual tendencies while trying to retain his marriage to his neurotic wife Harper; and infamous attorney Roy Cohn, who bullies past his own AIDS diagnosis to continue terrorizing America with his Red-baiting agenda. The outstanding cast included Ben Watts as Prior, David Wassilak as Cohn, Stephen Peirick as Pitt, Rachel Hanks as Harper, Aaron Paul Gotzon as Louis, Laura Kyro as the ghost of executed spy Ethel Rosenberg and Greg Fenner as Prior’s best friend, a drag queen named Belize. • #8: The Hairy Ape (Upstream Theater). Upstream Theater’s raison d’etre is “to move you, and move you to think.” Artistic director Philip Boehm frequently adapts works from around the globe, bringing a fresh perspective to their themes and ideas. With The Hairy Ape, though, Upstream turned to a rarely performed work by one of America’s greatest dramatists, Eugene O’Neill. Slight in construction and expressionistic in style, this short tale of a proud stoker on a steamship whose very existence is questioned by a vacuous, upper-class woman was given a harrowing and riveting rendition by Boehm. His superior cast included smart turns by John Bratkowski, William Grivna, Tim Schall, Michelle Burdette Elmore, Maggie Conroy and Christopher Harris in the title role. Harris hauntingly conveyed Yank’s descent from swagger and lord of his domain to savage edginess and fear. • #7: Ain’t Misbehavin’ (Stages St. Louis). A classically trained musician and a lover of Bach organ preludes, Thomas “Fats” Waller became renowned as a jazz pianist and composer who hit the top of the pop charts in the 1920s and ‘30s. That was no mean feat for a black man, but Waller often received a pittance for compositions that later became huge hits for white producers and performers. Decades after his youthful death, devotees Murray Horwitz and Richard Maltby Jr. put together a Tony Award-winning Broadway revue focused on Waller’s works. Stages St. Louis set this rendition with its characters essaying the roles of the original 1978 Broadway cast, a clever touch by director and musical stager Michael Hamilton. Dwelvan David, Eric Lajuan Summers, Willena Vaughn, Raena White and Wendy Lynette Fox comprised the accomplished troupe of singers and dancers, grandly accompanied by St. Louis jazz master Adaron “Pops” Jackson at the piano. The joint was jumpin’ with jazz and pizzazz. Playwright C.P. Taylor’s magnificent drama was given a powerful, engaging and engrossing presentation by director Milton Zoth for the St. Louis Actors’ Studio, and key to its success was B. Weller in the central role of Halder. Weller’s Halder was a master of rationalization, allowing outside forces to shape his soul and his destiny, methodically drifting along on prevailing winds. Pianist Tim Hearn added musical accompaniment judiciously throughout the drama, and Teresa Doggett offered a splendid turn as Halder’s fearful and inconvenient mother. A staccato uneasiness that permeated Good made for a probing excursion into the mind of evil. • #5: Sunday in the Park with George (The Rep). George, indeed, is in the park throughout this landmark two-act musical by Stephen Sondheim and James Lapine. In the first act, 19th century French painter Georges Seurat, father of the technique known as pointillism, works on his towering masterpiece, A Sunday Afternoon on the Island of La Grande Jatte, an extraordinary creation that consumed his life from 1884 to 1886. Seurat calls it “white, a blank page or canvas full of possibilities.” A century later, his great-grandson, struggling with his own artistic visions, visits the inspirational land of his ancestor. Director Rob Ruggiero’s production at The Rep fully realized the work’s magnificence in a breathtaking, stunning and deeply moving interpretation of both the musical and the painting that inspired it. His engaging cast contributed a collection of exhilarating performances, led by the impressive Ron Bohmer in the dual roles of the two Georges. The Rep’s profound interpretation was a resounding triumph on many levels that resonated long after the final curtain. • #4: Sweeney Todd (Opera Theatre of Saint Louis). In a neat little coincidence that would make Charles Dickens proud, Opera Theatre of Saint Louis’ sensational premiere production of the multiple Tony Award-winning 1979 musical by Stephen Sondheim and Hugh Wheeler was directed by Ron Daniels. It was Daniels who collaborated in 1973 with his former acting colleague, Christopher Bond, on a dramatic adaptation of the grisly English folk tale that debuted in a penny dreadful novel from 1845 titled Sweeney Todd, the Demon Barber of Fleet Street. Sondheim caught a production of that play and six years later introduced his brilliant musical version. Opera Theatre mounted an exhilarating and absorbing presentation that was top-notch in every respect. Rod Gilfry, who sang the title role in a Parisian performance last year, was commanding as the tortured and brooding Todd. Karen Ziemba combined her clear and precise mezzo-soprano with a deft gift for comedy as the practical if addled Mrs. Lovett, and shared a charming chemistry with Gilfry. OTSL’s presentation was a treat for all the senses, a smart combination of technical proficiency and Sondheim’s inspired genius. • #3: The Violet Hour (Max & Louie Productions). On April Fools’ Day 1919, aspiring publisher John Pace Seavering faces a serious dilemma. With money enough to publish just one work, he must choose between “a grouping of pages” compiled by his college pal Denis McCleary or the memoirs of his clandestine mistress, famous black songstress Jessie Brewster. Complicating matters further, his assistant Gidger informs him that a mysterious machine delivered to their office is spewing out papers from books published in the future. Playwright Richard Greenberg’s two-act gem is a masterpiece of cunning and deception. Intriguing and intoxicating, director Sydnie Grosberg Ronga’s interpretation for Max & Louie Productions ensured that Greenberg’s intricately layered musings were available to the audience through the pinpoint performances of her stellar cast and whimsical technical effects. Antonio Rodriguez, Drew Pannebecker, Monica Parks, Betsy Bowman and Jake Ferree were a fascinating delight to observe. You left the show scratching your head and contemplating a return to learn what you might have missed originally. • #2: Ma Rainey’s Black Bottom (The Black Rep). Four black musicians arrive at a Chicago recording studio on a wintry day in 1927. They comprise the band members who back up renowned blues singer Ma Rainey on the albums she records for a white producer. They kill time until she tardily arrives with her stuttering nephew Sylvester and a young woman. She insists that Sylvester record the introduction to her latest song, just one in a series of aggravations for the band, her manager and producer that lead to short fuses in the cheap and decrepit old studio. Playwright August Wilson’s dialogue is a joy to hear, writing so conversational that it’s easy to forget you’re watching a production rather than eavesdropping. His words poignantly express observations about the social and political mores of an era, including the racism, overt or subtle, that follows these musicians on their travels. Directed in crisp, clear and cogent style by Ed Smith, The Black Rep’s production featured a cast that was uniformly superb. Jaki-terry as Ma showed us a woman who uses her considerable talents to exert what influence she can, while Ron Himes, Erik Kilpatrick, Antonio Fargas and Ronald Connor were totally convincing and masterfully engaging as the band. With this jolting presentation, The Black Rep was off to a rousing start in its second tour of Wilson’s acclaimed Pittsburgh Cycle of 10 plays set in each decade of the 20th century. • #1: Clybourne Park (The Rep). Chicago’s Clybourne Park neighborhood in 1959 is a fine place to live, if you look like its white residents. When a black family purchases a home there, the president of the neighborhood association asks the white couple selling the house to reconsider, then attempts to get the black family to back away at a slight profit. In the drama’s second act, fast forward to 2009, where the same brick bungalow is a shabby shadow of its former tidy existence. A trendy young white couple wants to gentrify the inner suburban structure but meets resistance from the local black community that inhabits the neighborhood. While half a century has passed, political correctness can’t disguise growing hostility between new residents and long-term members of the community. What makes this multiple award-winning piece by Bruce Norris, inspired by Lorraine Hansberry’s landmark play, A Raisin in the Sun, stand out is a remarkable foundation built on a specific human story that is the real bricks and mortar of a provocative and poignant tale. Director Timothy Near masterfully guided The Rep’s compelling rendition in its Studio Theatre, which featured an eye-popping set design by Scott Neale that visualized the sharp contrast in the home five decades apart. Superior performances abounded by a stellar septet of players nurtured by Near, including Nancy Bell, Mark Anderson Phillips, Eric Gilde, Chauncy Thomas, Tanesha Gary, Michael James Reed and Shanara Gabrielle, all taking on different but equally challenging characters in the work’s two separate but related acts. The Rep’s presentation was a superior example of insightful writing and crystal clear interpretation that grabbed your heart and soul in an iron vise. Who knows what 2013 will portend on local stages? Doubtless, though, we’ll be treated to artistic theatrical triumphs every bit as profound as what we were fortunate enough to witness and experience this year.